Any fertile soil with excellent drainage. Very limited. A few lantana varieties will persist as perennials where winters are mild, but most are killed by hard freezes. Mix a standard application of a balanced organic fertilizer into the soil prior to planting along with a generous helping of well-rotted compost. When growing lantana in containers, use a coarse potting soil that drains well. Lantanas are sprawling plants that attract huge numbers of butterflies, so locate them where they are easily seen on sunny days. Only a few lantana varieties are available as seed, but it is better to start with vegetatively propagated plants because they are seed sterile and cannot become weedy. Most gardeners buy lantanas as bedding plants, which are sold in late spring and early summer as warm-weather bedding plants. Large varieties may need wider spacing, or you can grow them in 14-inch (35cm) diameter containers. Many lantanas have florets that change color as they age. Blooming is best in very warm weather. As long as they have ample water, lantanas tolerate extreme heat. Snip off any seed clusters that form and discard them, as they are poisonous. 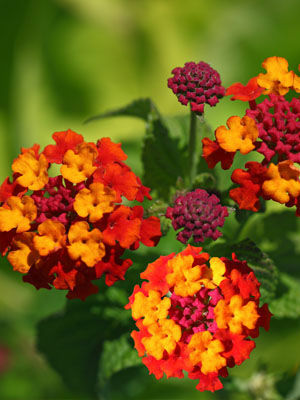 Lantanas that dry out often can be brought back to life with regular water and fertilizer.